The SI Draw-Off mentioned last time was not exclusive to the four editors. In fact, this meme is open to the whole SI Crew, so if any of you have an Optimus Prime picture itching to “roll out,” then feel free to send ’em our way! 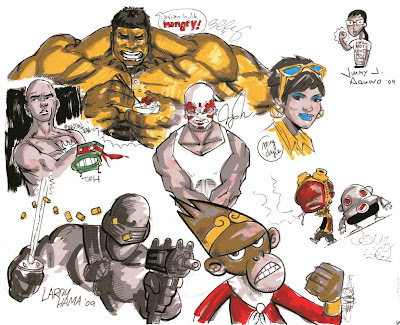 As promised, here are a few more Optimus portraits from real artists. To your left is our friend Bernard Chang‘s contribution to the challenge. To make things more difficult, Bernard drew The Heartbreak Prime in less than five minutes while playing poker with Parry and friends. Had no idea the Autobots were down with wrestling factions from the mid-90s. Does this mean the Dinobots are the nWo? 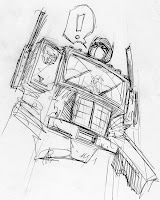 Up next is a take on Optimus by our very own Senior Artist Jef Castro. The second Jef heard about the meme, he knew he had to take part, so he whipped up this sketch in a matter of minutes! And look at him. All dramatic and stuff. And if you notice, all the real artists (Jerry, Bernard, Jef) actually drew windshield wipers on the chest. Damn artists and their attention to detail! 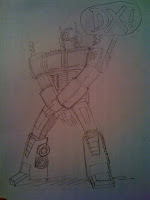 So, is there anyone else out there in Secret Identities Land that wants to step up to the plate with their own Optimus?